This lavender lotion is made with pure, organic French Lavender Essential Oil to protect and soothe the gentlest of skins. Suitable for ages six months and up. 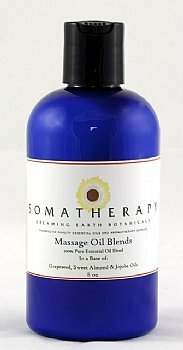 This lotion can be applied for an all-over soothing massage or to moisturize spot areas. Very gentle and relaxing. The four and eight ounce sizes come in a cobalt blue plastic bottles and larger refill sizes come in plastic bottles with flip tops.